which will focus on turnaround stories and emerging opportunities! Future looks interesting and exciting as Indian economy is steadily and surely undergoing a transformational change. Political management of economy both at Centre and the States is being oriented towards mega development and radical progress. We see host of reforms leading to "one big pattern of eventual migration of economy”. Migration from “Black to White economy”, “Informal way of doing business to Formal”, “Cash to Digital”, “Nepotism to Meritocracy”, “Inefficient to Efficient”. AIF provides Fund Manager the freedom to pool funds and employ diverse investment strategies, use leverage, subscribe to preferential allotment, institutional placements etc. 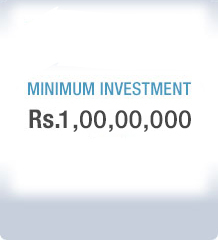 Minimum investment under AIF is Rs.1 Cr as per SEBI guidelines. Please contact us for more details. was 13.28% vs Nifty returns of 0.93%. *Weighted average return of clients who joined in 2003 as on 31-Mar-2018.